*All of the foundation wall pours in Area D of the basement are complete. 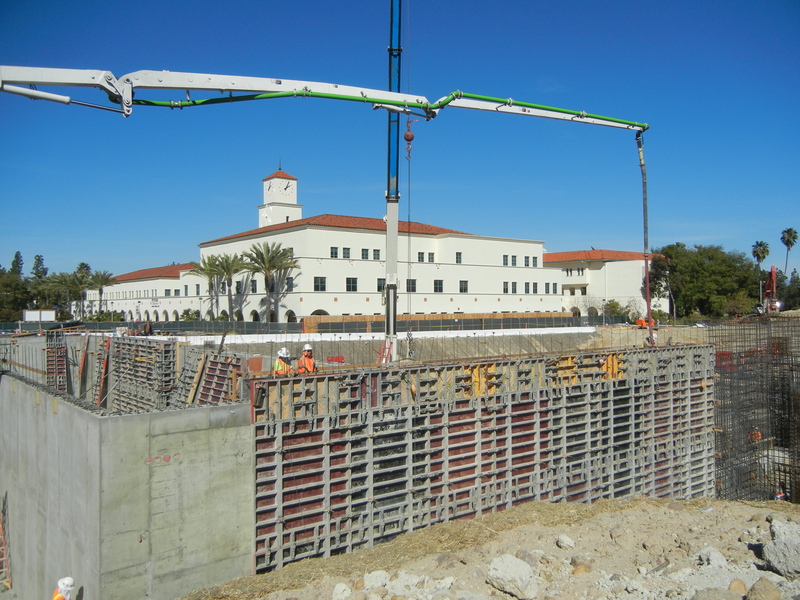 *Foundation wall pours in Area C of the basement are ongoing, including Section #8 today and Section #6 on Friday. 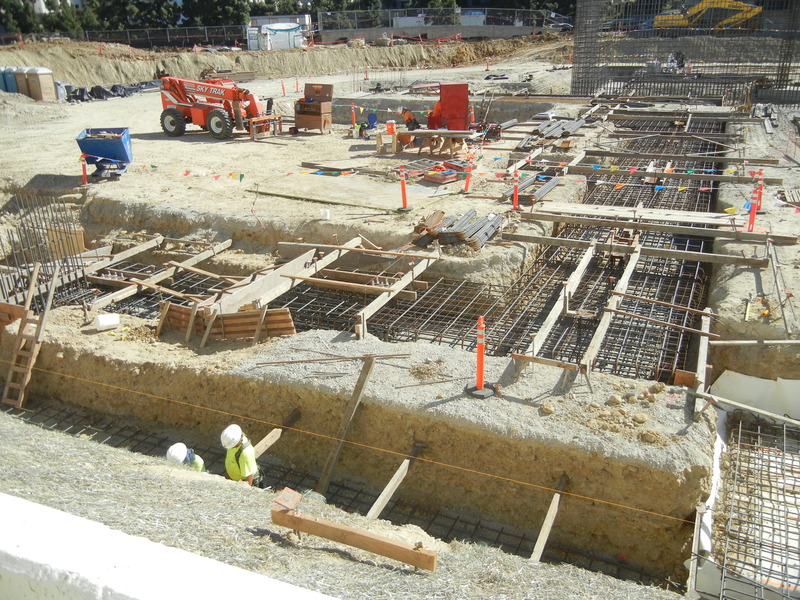 *A big footings pour is scheduled for tomorrow in Area A of the basement. 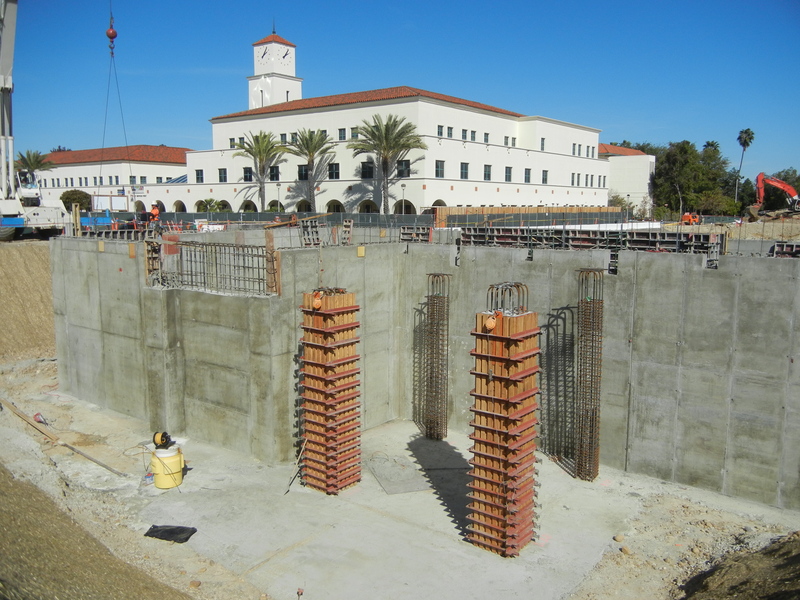 Approximately 350 cubic yards of concrete will go in, and it will be the last foundation pour of significant size. 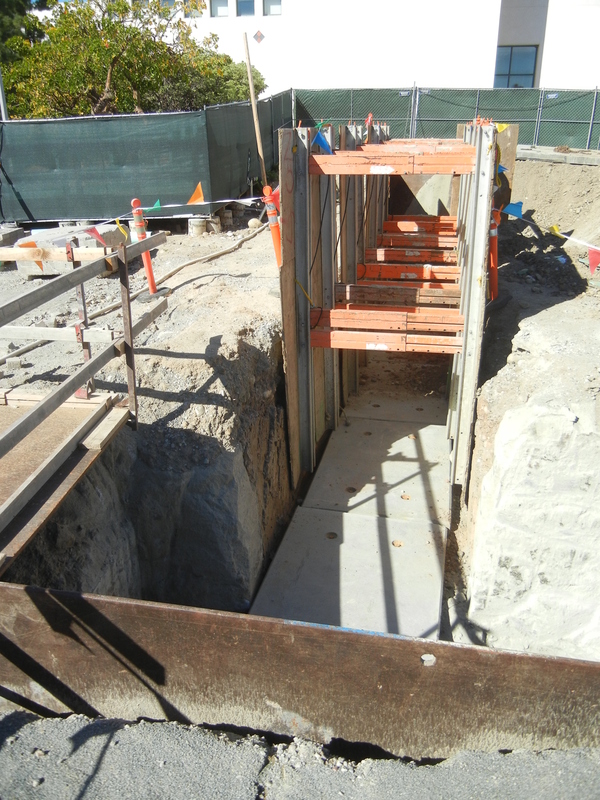 The remaining footings pours won’t occur until after the demolition of utilities is complete under Aztec Circle Drive. *Other foundation work this week and next include the pouring of elevator pit walls, as well as interior and exterior backfill around the walls in Area C and Area D.
*Work has resumed – and will soon wrap up – on the northwest section of the steam tunnel. The installation of the roller guides that the pipes rest on began today. *The northeast section of the steam tunnel passed its test yesterday. 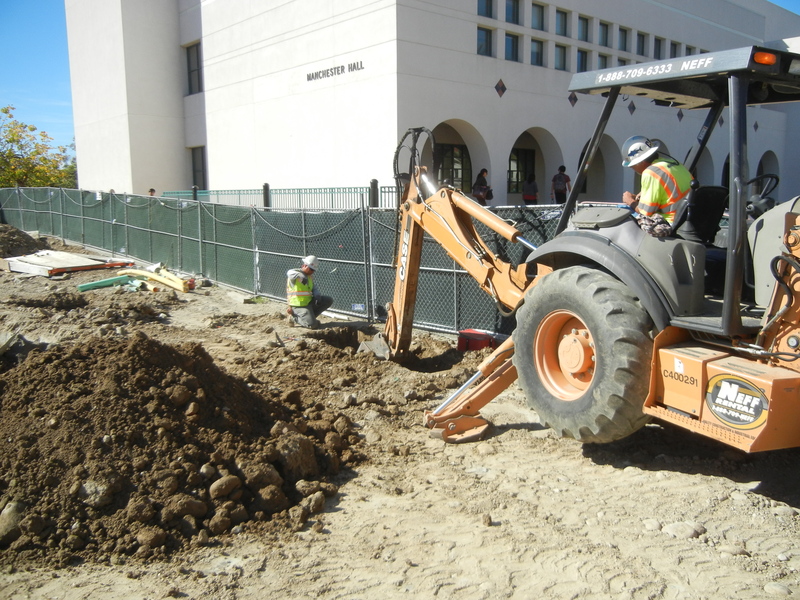 Backfill is scheduled to begin tomorrow. Meanwhile, the old steam tunnel that lies adjacent to the new one is being demo’ed. 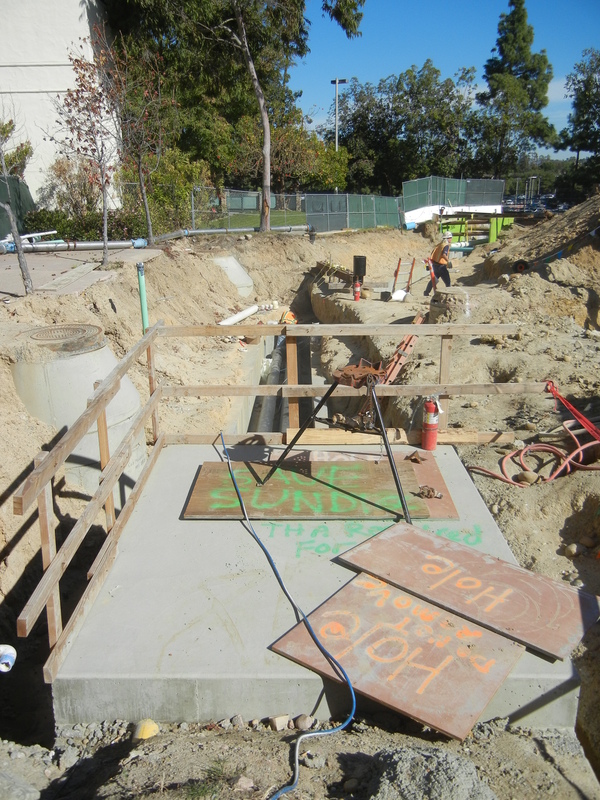 *Work on the sewer in the northwest section of the site is complete. All that’s left is the tie-in. 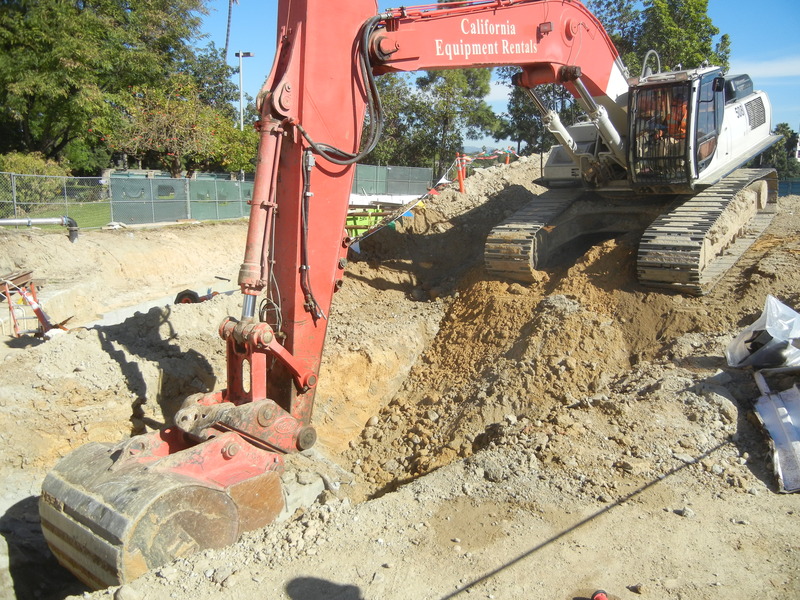 In addition, excavation is underway to replace the storm drain. *The sidewalk along the MTS bus depot is scheduled to receive some cosmetic repairs this weekend. 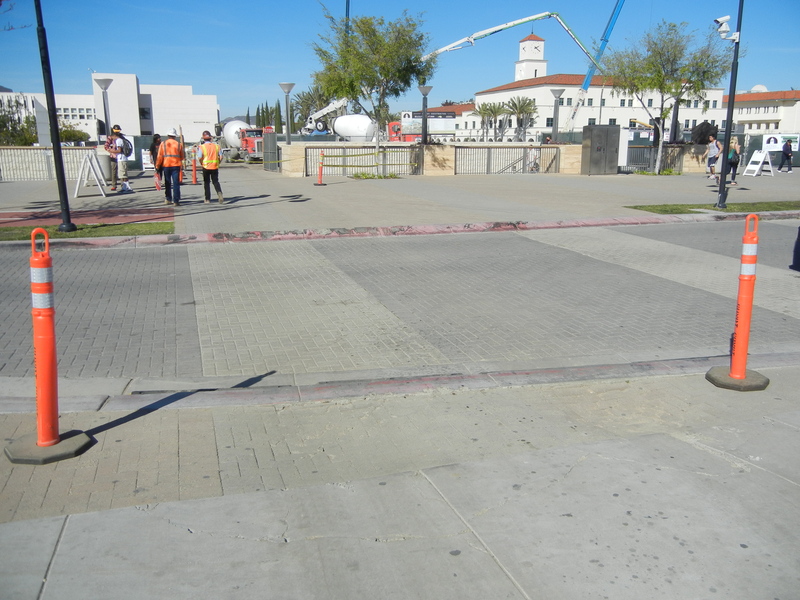 New pavers will be placed for a flatter surface to help ensure the safety of pedestrians. *Finally, it’s time for our “Construction Terminology” segment. Today let’s go with “pavers” since some of you may be scratching your heads. A paver is a pre-cast piece of concrete or brick commonly used in exterior hardscaping applications. Interlocking paving stones are installed over a compacted stone sub-base and a leveling bed of sand. Concrete paving stones can be used for walkways, patios, pool decks and driveways. Instead of connecting the pavers by pouring grout between the joints as one would with tiles, sand particles are spread over the pavers and tamped down. The sand stabilizes the interlocking pavers, yet allows for some flexibility. you have done a good job their! Paving can often be very tricky!